Who knew my brother was a romantic? Many folks know the story, but Jeremy proposed on the beach in Florida, the catalyst to us deciding to get married on the beach just a year after the engagement. He's not the most romantic guy, but it was wonderful and his mom was just thankful the ring didn't appear somewhere mid-flight and he didn't propose to me sitting in coach eating peanuts. Hard to believe that was seven years ago now! Until last weekend, I thought my brother was pretty similar to Jeremy in the romance category, but perhaps they all have a bit of a hopeless romantic bottled up inside! I've known A LOT of proposal stories, but my brother's now takes the cake! He's been conspiring since NOVEMBER--with the ring bought, permission from her father given weeks ago, but he waited until all the stars alligned and it was perfect! He invited her family from Michigan and us from Indianapolis (Aunt Cat you were SOOOOOOO missed!) to Joseph Decuis Restaurant in Roanoke, IN. She thought she was attending a vendor appreciation dinner and they did a tour of the farm, complete with a winter sleigh ride. He proposed, she said yes, they then headed to the restaurant for dinner. A private room with all of us and her entire family awaited them! Good food, great atmosphere and a fabulous beginning for the two of them! Congrats to Maggie & Jon! Complete shock as she came in the room! The three look-outs watching out the window for their truck to pull up tot he restaurant. Charlie is in the middle--Maggie's ADORABLE nephew--apparently Lilly knew love was in the air! Another change....it's true, change really is the only constant. I vividly remember finishing their nursery as I entered the third trimester (see pics here). I remember sitting in the rocker, rubbing my belling, dreaming and praying that I'd bring 2 healthy babies home from the hospital, and I did. I remember the tiny bassinet they slept in for their first 6 weeks home. I'd roll over at night and just stare and them, dreaming and praying that I wouldn't make too many mistakes, I did and their unconditional love showed me it was okay. 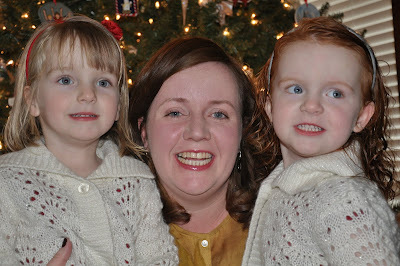 I remember moving them into the nursery, right around their due date. I tip-toed into that room every hour on the hour, checking to make sure they were still breathing. I sat in their rocker, continually amazed that they were all mine. Some nights they'd scream in pure terror and I'd ask Jeremy when he thought it would be that they'd climb into bed and fall asleep without fuss? 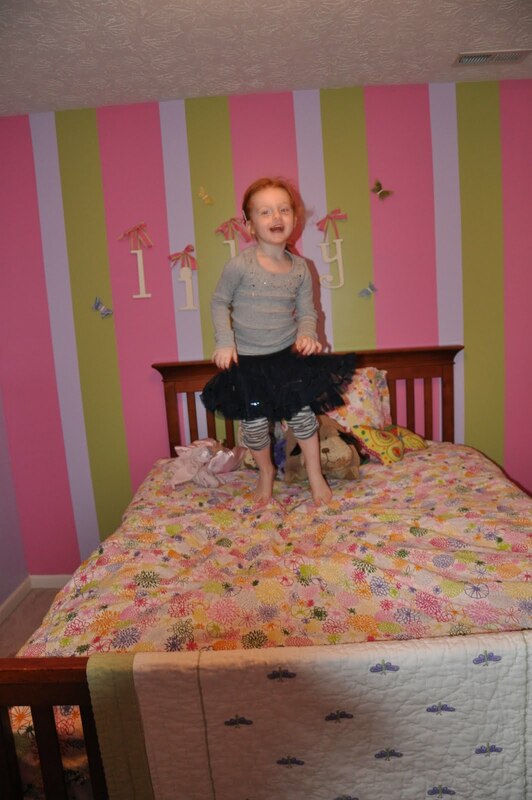 Before long, it was time to move them out of cribs and into rooms of their own, a transition I dreaded and they didn't handle well (see pics here). My night time stops before bed doubled and Lilly began to insist she sleep under a fort and Addy slept with a minimum of 15 blankets and stuffed animals, so sometimes getting a peek of them would inadvertently wake them up. Sometimes when they were in their deepest sleep, I'd share my dreams and prayers with them. 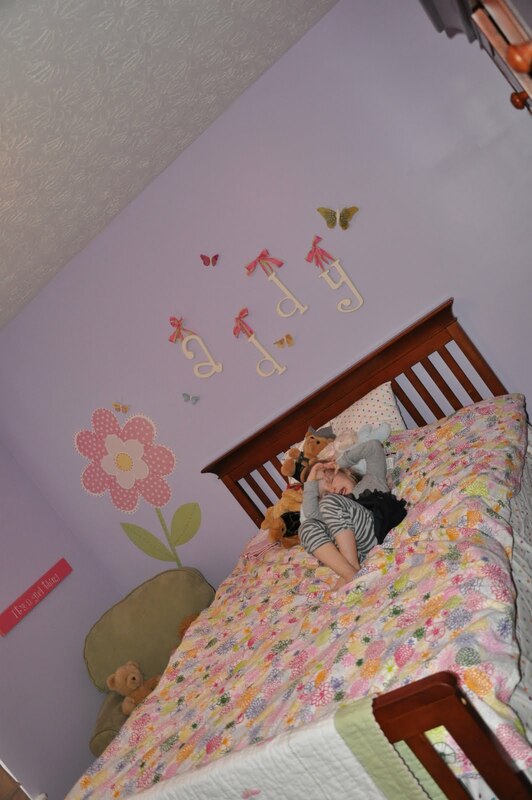 Last night, just shy of the 3 1/2 year mark their little beds became big beds. My little girls all of a sudden seemed so very, very....BIG. I brushed teeth and read books, then they both climbed into their big beds, waited patiently to be tucked in and drifted off to sleep. I stopped in last night and thanked God that we've made it this far and to recognize that most days I forget just how fortunate we are. The girls each got a Fisher Price Kid Tough digital camera from Santa, so I thought I'd dedicate a blog to some of their shots. I figured it would be a good glimpse of life through their eyes. 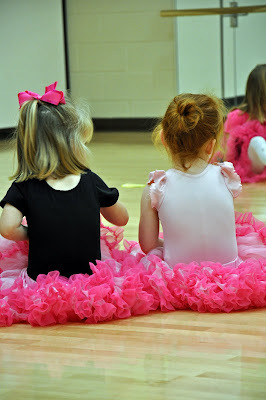 After reviewing over 200 photos, I learned a few things. 1. Daddy takes far too many naps. 2. Mommy drinks far too much wine. 3. The girls watch far too much Mickey Mouse Clubhouse. Enjoy! When I showed this to Addy, she said, "I was taking pictures of my best friends"
Grandpa Ian, probably taken by Addy as he would fall into the best friend category too! 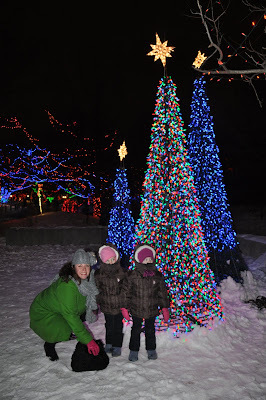 Christmas at the Zoo--we braved the cold and it was worth it! When you see my Aunt Cat, yell "AUNT CAT!" Walking out into the Indianapolis Airport Concourse and hearing two tiny voices yelling "AUNT CAT!" and having two tiny little people launch themselves into my arms was one of the highlights of my trip. Visiting Addy & Lilly is always an adventure, they never disappoint. 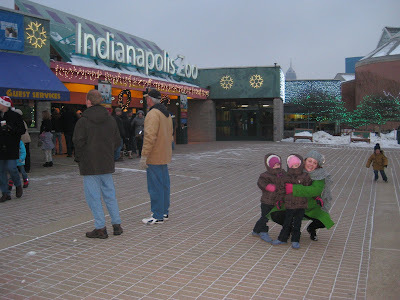 After we left the airport we went to the Indianapolis zoo but not before receiving instructions from Lilly who said "Guys, guys this is the plan when you see more planes yell 'more planes!'" They were both in rare form at the zoo, petting the dog sharks and exclaiming "Ohhhhhhs and Ahhhhhhhs!" 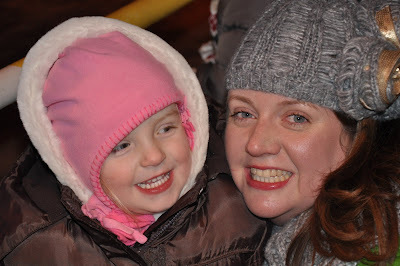 at the Christmas light displays. They received "Elf on the Shelf" on the first day of December, the elf, who they named "Bubba Fiji" served as quite a tool for Aimee and Jeremy. Any instance of bad behavior was immediately reported to Bubba Fiji who apparently has Santa's ear. I will never forget the singing, Addy and Lilly know the words to nearly every Christmas carol that exists and have no problem correcting anyone who sings one word incorrectly. We all went to church on Christmas Eve and the reason for using electric candles instead of real candles was made abundantly clear by Addy and Lilly collecting an entire church pew's worth of candles in one of their cups. We left a note for Santa and some carrots for the reindeer and then headed to bed. At about six o'clock AM Lilly said she thought she heard sleigh bells on the roof which is pretty much the only sentence that can melt your heart at six in the morning. After stalling for as long as we possibly could until Grandpa and Grandma arrived to watch them open gifts Addy & Lilly opened countless presents ranging from pillow pets (a dolphin for Addy and a doggie for Lilly) to a pretend grocery store & cash register that quickly became Lilly's favorite toy of all time. I don't think that I have gone grocery shopping for real as many times as I pretended to grocery shop in Lilly's store. I have to give it to the kid though she is quite an entrepreneur, as she charged me $6.00 for a tiny container of milk. Luckily for me she accepts credit cards.